On Friday afternoon, 7 September, delegates reconvened for the final plenary session to consider the draft report of the conference. The report contained an outline of discussions on all agenda items, as well as two appendices. Appendix 1 contained the text of the Global Plan of Action for Animal Genetic Resources, while Appendix 2 contained the final version of the Interlaken Declaration. Delegates adopted the report with only minor amendments. After closing remarks, Chair Manfred Bötsch declared the conference closed at 2:35 pm. Above: Chair Bötsch presented flowers to Conference Secretary Irene Hoffman, FAO, and awarded her the conference bell in recognition of her efforts. Conference Chair Manfred Bötsch thanked delegates for their excellent spirit of openness and cooperation, which he labeled the "spirit of Interlaken." Rapporteur Jasmin Holness, Jamaica, introduced elements of the report. José María Sumpsi Viñas, Assistant Director-General, Department of Agriculture and Consumer Protection, FAO, congratulated delegates on behalf of Jacques Diouf, Director General of the FAO. The Secretariat of the Pacific Community said he would support implementation of the Global Plan of Action among the 22 members of his regional group. Poland, speaking for the European Regional Group, said the Interlaken Declaration was "highly significant." Vanida Khumnirdpetch, Thailand, on behalf of Asia, expressed satisfaction with the conference outcome, noting the Global Plan's significance for the region and the importance of implementation at country level. Côte d'Ivoire, speaking for Africa, expressed hope that the Interlaken Declaration would serve as a compass to facilitate the sustainable use of AnGR. Canada, for North America, described the Global Plan as a "starting point" and "milestone," underscoring the need for sustainable use and conservation of AnGR. Carlos Mezzadra, Argentina, for Latin America and the Caribbean, reiterated the importance of the Global Plan, which he said closed a long period of negotiation. Fadila Al-Salameen, Kuwait, for the G-77/China. Hussein Ibrahim Abu Eissa, Sudan, for the Near East. Sunil Chandra Ghosh, Bangladesh, thanked the organizers. The Commission on Genetic Resources for Food and Agriculture thanked the organizers and congratulated the secretariats and participants. Noting the joint FAO/IAEA program on nuclear techniques in food and agriculture, the International Atomic Energy Agency offered congratulations. Chair Bötsch presented flowers to François Pythoud and Barbara Rychen of the Swiss organizing team. Irene Hoffmann, FAO, said the development of the State of the World's Animal Genetic Resources report and the Global Plan was the result of a long process, and she was delighted at the success of the conference. Clive Stannard, CGRFA, said this conference had launched a whole new series of activities that would play an important role at a critical time. David Boerma, FAO, key member of the organizing team, after the closing session. Some very fortunate Interlaken high school students missed an entire week of classes to help with the conference. FAO's Irene Hoffman posed with delegates from throughout the African region. Conference organizers from the Swiss government and FAO posed for a group photo after the closing session. 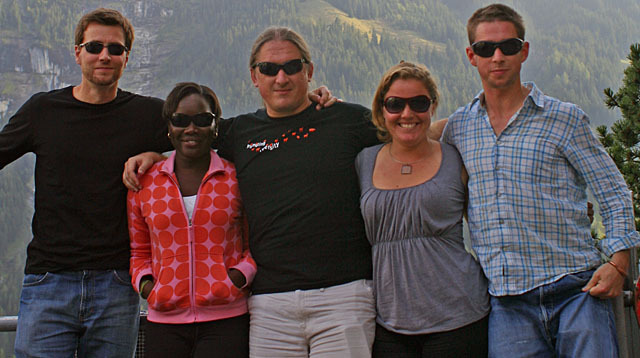 Your Earth Negotiations Bulletin team in Interlaken: Chris Spence, Team Leader, New Zealand; Asheline Appleton, Writer, Kenya; Dan Birchall, Writer/Digital Editor, United States; Melanie Ashton, Writer, Australia; Harry Jonas, Writer, United Kingdom.